When we walked in and saw the amazing panoramic views we just looked at each other and knew it was perfect. The unspoilt local town of Sao Bras de Alportel is ideally situated for touring the Algarve and is just fifteen minutes from Loule, twenty five minutes from Faro airport and close to Tavira and the Spanish border. Lisbon is an easy two hour drive. The villa is truly a home from home.The location is peaceful with breathtaking views over the valleys, yet the town centre is just a couple of minutes down the road. We love eating alfresco on the upper terrace where there is a traditional Portuguese barbecue (or our fantastic Kamado Joe) and then relax with a glass of something chilled under the pergola beside the lemon and orange trees in the garden or then again you could go for a bike ride. Full en-suite bathrooms to Super King bedroom and Twin bedrooms. En-suite to Kingsize double bedroom with walk-in shower,hand basin and toilet. All en-suite bathrooms have underfloor heating. Also Beach towels provided on request. Large lounge/diner, air conditioning (heating/cooling & dehumidifying), fan assisted log burning fire, CD Hi-Fi, Satellite, LED TV, Blu-ray DVD player, Wi-Fi connection (Dongle) and Nintendo Wii console. Luxury spec. fully equipped kitchen with gas cooker, dual fuel hob, microwave, fridge/freezer, dishwasher, Nespresso inissia coffee machine. Smart T.V - Watch Netflix or many other Wi-Fi enabled online accounts. Smart T.V - Also Watch Netflix or many other Wi-Fi enabled online accounts. Take a look in the cabinet for a selection of books. There are always some pool toys including floats, balls or inflatables in the laudndry room available. Bike Hire available £15 per day 3 days minimum hire. £25 returnable damage deposit per bike. Includes Helmet, bike locks and puncture repair kit. Large terraces with panoramic views of the valley and distant sea view. Located conveniently for the 'Golden Triangle' Vale Do Lobo, Quinta Do Lago, Vilamoura Golfing resorts 20 mins away West. Going East Monte Rei golf and Country Club (18 hole) championship golf courses, Quinta da Ria and Quinta de Cima championship Golf courses (18 hole ) are approx 20 mins. Benamor is approx 20 mins. Colinas Verde is 20 mins (9 holes). We highly recommend Monte Rei Golf Club, newly opened in June 2007, this Jack Nicklaus designed course is one of the most challenging on the Algarve, if not Portugal. 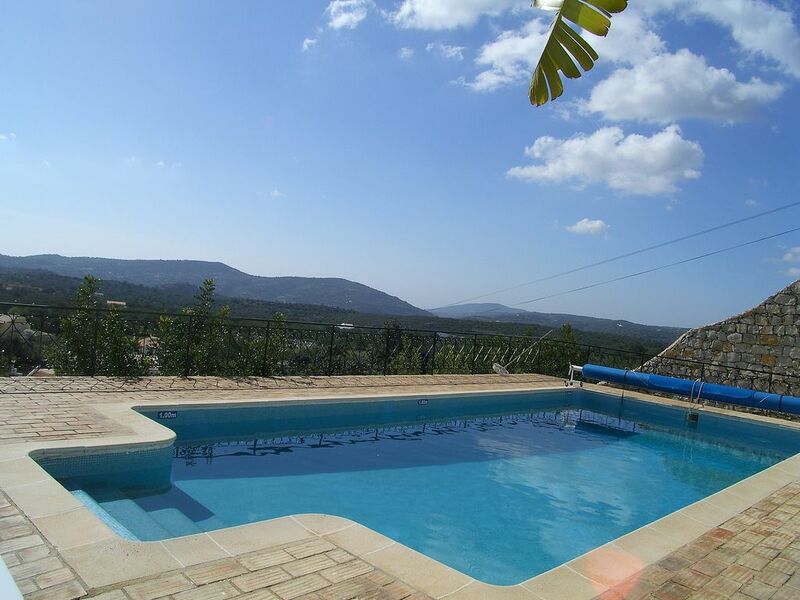 It is a 20 minute drive from the villa, close to the town of Tavira. The perfect home away from home. Luxury with all the added comforts. The property is most certainly 5* accommodation. The facilities are perfect and have everything you need plus lots more. The kitchen had every appliance you could hope for and had a lot of everything. We spent very little time if any in the lounge, that was predominantly used as a walk through to get outside. The outdoor seating was perfect, extremely comfortable. The pool was a great size and clean and deep with stunning views. The only slight negative would be that the shower head in the upstairs bathroom was faulty and the shower on offs took a bit of working out but it made no impact on our stay. It would also have helped to have a bit of a welcome pack to give some information on the area, local supermarket, restaurants etc. But again, we are quite adventurous so not a massive deal for us. Car is absolutely essential. We will def recommend and re visit the property. Thank you for our memorable stay. Thank you for your review. We have now addressed the shower head and will also look at the welcome pack issue. We are really pleased you had a great time and look forward to hosting you and your family again at our villa in the future. The villa is well off the beaten track, even the local taxi drivers struggled to find it. It has stunning views morning, noon and night. The local town is a five minute drive and is very cheep for eating out (Lois chicken is a must), there are a few supermarkets if you choose to use one of the magnificent BBQ"s in the villa. The villa is well furnished and it was nice that all bedrooms were ensuite. Thank you for your review. Just to clarify the villa is accessed by a private macadamised road off the main road a few minutes from the town. We've recently returned from a 10 day stay at the villa and had a fantastic time. We were a family of 6 and there was more than enough space for us all. The villa was exceptionally clean and well equipped. The pool was perfect. There were some wonderful restaurants costing just a few euros in a taxi to get to, so only minutes away. The square in Sao bras is lovely too, a real unspoilt Portuguese town. The location was perfect for visiting tavina, faro and ayamonte in Spain, all approximately 30 minutes drive away and all definitely worth a visit. We also had a day trip to Lisbon which was fabulous; a long day but worthwhile. Overall a very enjoyable holiday. This house is an excellent choice for any family with lots of space and a good sized pool. The house was very clean and we were settled in within minutes. The children enjoyed the fast internet connection to watch Netflix when it was too hot outside. Villa is ideal in terms of location,standard , space and appliances. I holiday in villas three times a year and this one is as good as and better than most. Journey from airport was as indicated a simple twenty minute drive given the directions Michael had supplied. Already thinking of returning next year. We were 5 people staying in Casa Boa Sorte for 2 weeks. We can't express well enough how happy we all were in the villa. The owners have certainly put a lot of effort, care, thought and love in the villa and we could feel it in every corner. The pool is a real gem. We couldn’t get out of it during those hot days. The furnished terrace is the place to be for breakfast and dinner. But be careful! It will make you drink a lot of G&Ts, admiring the views and the sunny sky. The 3 bedrooms with an ensuite each were furnished with taste and great quality. The owners really cared for us providing all we needed from directions to the property to answering promptly to any inquiry we had. Vale Do Lobo, Quinta Do Lago, Tavira and Faro beaches can all be reached in approx 15-20 mins by car. Where nautical sports are available. Tennis and Horse riding are 5mins and 15mins away. Airport: Faro (20 mins). Car essential. For car hire, we use and can recommend www.amoita.com/casaboasorte They have a wide range of quality, well maintained cars at competitive prices and can meet you at Faro airport or even the villa if preferred. Please quote my name and ref: 20003538, if you decide to book with them. The town centre of Sao Bras de Alportel is 1km from the villa with its host of places to eat a Saturday fresh fruit and vegetable market and 'museum of costume'. Loule and Faro are between 8-12 kms away with there host of restaurants, shops and a shopping centre. Loule has a large Saturday market with ceramics, fruit and vegetables, fish etc. The Algarve Tourist board shop is 1km away in the town along with major banks, supermarkets and restaurants/cafes. Booking Notes: 30% non-refundable deposit and the balance be paid in full, 8 weeks prior to commencement of holiday. There is a £250 (payable with balance) fully refundable damage/breakages deposit after a satisfactory inspection by our villa manager and the return of the keys. Pool heating is charged at £350 per week and Under floor heating, to all bathrooms, at £50 per week(In those cooler months). (Alojamento Licence 12219). Bike Hire available £15 per day 3 days minimum hire. £50 returnable damage deposit per bike. Includes Helmet, bike locks and puncture repair kit. (Subject to availability). Travel Cot available free of charge. . Changeover Day: We are flexible on changeover days. Departure times are 10am on day of departure for clients and arrival is 3pm. (unless otherwise arranged by management).